Squire Trelawney, Doctor Livesey, and the rest of these gentlemen having asked me to write down the whole particulars about Treasure Island, from the beginning to the end, keeping nothing back but the bearings of the island, and that only because there is still treasure not yet lifted, I take up my pen in the year of grace 17— and go back to the time when y father kept the Admiral Benbow Inn, and the brown old seaman, with the sabre-cut, first took up his lodging under our roof. "I lived on rum, I tell you. It's been meat and drink, and man and wife, to me." I dare say he met his old Negress, and perhaps still lives in comfort with her and Captain Flint. It is to be hoped so, I suppose, for his chances of comfort in another world are very small. Oxen and wainropes would not bring me back again to that accursed island; and the worst dreams that ever I have are when I hear the surf booming about its coasts, or start upright in bed, with the sharp voice of Captain Flint still ringing in my ears: "Pieces of eight! pieces of eight!" No one needs to be told what Treasure Island is about. Robert Louis Stevenson's novel has defined the pirate story, not to mention the treasure-hunting story, the mutiny-on-the-seas story—and the adventure story in general for both children and adults. At least a dozen films have been made of Treasure Island, not to mention television shows, cartoons, spoofs and sequels. But what makes this story a perennial favourite? It's a superior adventure of course. Jim Hawkins and his mother find a treasure map among a dead pirate's chest at their inn. Evading a gang of cutthroats who come after the map, young Jim and his benefactor Squire Trelawney set sail to find the treasure. However, their crew of pirates led by the one-legged Long John Silver try to mutiny to go after the treasure themselves. So begins a battle on board that carries on to the island. Exciting stuff, with mystery, murder, greed, skullduggery and heroism—with good ultimately triumphing, of course. A ripping good yarn, as they say. And told so well. All the details of character, plot and dialogue create about as scary and suspenseful an atmosphere as you could imagine. Everyone of course remembers the pirate's song from Treasure Island that starts "Fifteen men on the dead man's chest". It's thought Stevenson got that from a song that originally referred to an island called Dead Man's Chest on which the real-life pirate Edward Teach is supposed to have stranded fifteen men with a bottle of rum and a sword. What really makes the story great though is the character of Long John Silver. Instead of simply having a black-hearted villain blocking the heroes, Stevenson has created an enduringly enigmatic and magnetic character. He may indeed be a black-hearted villain, but he's also a soft-hearted rascal who befriends Jim to oppose the really bad guys—though you can never be sure how much goodness there is in him or how much he is playacting for personal gain. He helps save the lives of the innocents—but he still manages to double-cross them to make off with a portion of the treasure himself. All through he's a blustering, wisecracking force of nature. Like a craftier Falstaff. This doesn't adequately sum up what attracts us to Long John though. There's something else magical about him that we can't quite put a finger on. Maybe it's this elusiveness itself that appeals to us—the enigma of the man. But we know that without him we'd have a much less interesting story in which good little Jim displays a cunning beyond his years to outwit and overpower a whole gang of pirates on his own. That too might have been a good tale, but not as intriguing as the one with Long John Silver playing all sides. Stevenson has perhaps invented the first anti-hero—a far from perfect, maybe even wholly bad, man whom we root for. He would do a similar thing, though not quite as extreme, in Kidnapped, with the flawed character of Alan Breck, again seen through the softening eyes of a plucky young lad. A great mystery is why Stevenson didn't write any sequels featuring the popular pirate in further escapades. 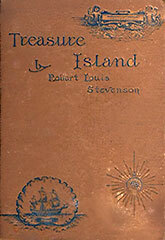 He disappears at the end of Treasure Island and we start missing him before we even close the book cover. He lives forever though in movies, remakes and sequels. And in every story of adventure on the high seas and exotic islands.